Eating Tarte Normande the first time I couldn't exactly tell how it was made. It was a large round open tart. The crispy pâte feuilletée (French puff pastry) was filled with apples baked in some delicious custard. Later I found it was frangipane (sweet and soft almond paste). It also had this special aroma which (as I know now) comes from Calvados. When the lady in my bakery noticed me frequently asking for the Tarte Normande she asked if I wanted it "aux pommes ou aux poires?" (with apples or pears?). Thus I tried the one with pears and preferred it. That was my first attempt to make the Tarte Normande at home. Peel, core and quarter the pears. In a medium pan dissolve the 80 gr sugar in a cup of water. Add the pears, bring to boil and cook under a lid for 10 minutes. Remove from heat, add lemon juice and let the pears cool down in the syrup. To make the frangipane stir together the butter and 70 gr sugar. One by one mix in the egg, ground almonds, flour. Add the calvados and almond extract. Roll the pastry into a circle and cover a buttered 22 cm round baking dish with it. Fork the pastry. Pour in the frangipane and even the layer. Take the pears out of the syrup and dry them slightly. Place the pears on the frangipane and press them down. Sprinkle with icing sugar. Bake at 200C for 20 minutes. Then reduce the temperature to 180C and bake for another 20 minutes (40 minutes in total). Take the tart out of the oven and let cool a bit inside the baking dish. 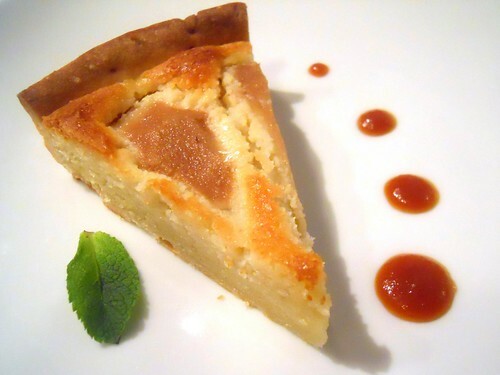 Reduce the pear syrup for around 1/3 and brush the tart with it to make it glossy. Serve warm on its own or with vanilla sauce or ice-cream. This time I served it with my favorite caramel sauce, though it might be a bit too sweet for it. This time the tart came out tasty but not exactly the same. Google, Wikipedia, L'Internaute and all the possible sources seemed to be sure that the proper pastry for the tart is pâte sablée (French short pastry). I tried it with pâte sablée this time and now I'm sure the one I liked so much was made with pâte feuilletée (puff pastry). The frangipane also turned out a bit thicker then the one I'm used to. This might be because in the bakery they used sour cream at the place of butter (I came across different recipes). Thus I'm making another one shortly. Первая фотка - просто шедевр. I'm making a pear tart later this week from a recipe from the 'Riverside Cookbook' and the ingredients and quantities are very similar. What is interesting to me is that recipes travel and then become transformed-perhaps from necessity. The inclusion of apples with calvados makes, in my opinion, something quite unique altogether. With apples, however, I would be tempted to make a pie in the english/american style (ie deep) or a galette (thin), a la chez Panisse. Sultanas & raisins etc seem to work well with apples and I rarely see them incorporated in a recipe with pears. But in this case the delicate flavours of ripe pears work tremendously well with the frangipani. Thank you, that sound like a very interesting combination! Will keep it in mind! I found your recipe and was delighted as I have been looking to try to figure out the ingredients of a pear pie I had many years ago. I was a waitress at Peroshka. A small cafe in Harvard Square, Cambridge. The owner, Rainer, used to buy the pear pies from a woman who would bring them into the cafe in the evening and it was all we could do to stop ourselves (meaning the staff and waitresses) from devouring the pies! The owner, Rainer, used to go through the receipts trying to track the orders. He could never find very many receipts. He was quite generous though to the staff and waitresses and complained little about our (okay I will speak for myself, my) bad behavior. Unfortunately, I never knew the recipe. So I think this really is the recipe. There was a distinctive taste (which thanks to your recipe, I now think is the Calvados) in the custard like filling. Another similarity is the way you positioned the pears on the top. My first attempt is now in the oven! I substituted sour cream for the butter as I think that is also what she used. Thank you so much for sharing this recipe! I have many great memories of my job, fellow workers those years ago, the wonderful owners, & the woman who brought the pies in.